Carol Morley, Out of Blue, 2019, DCP, color, sound, 110 minutes. 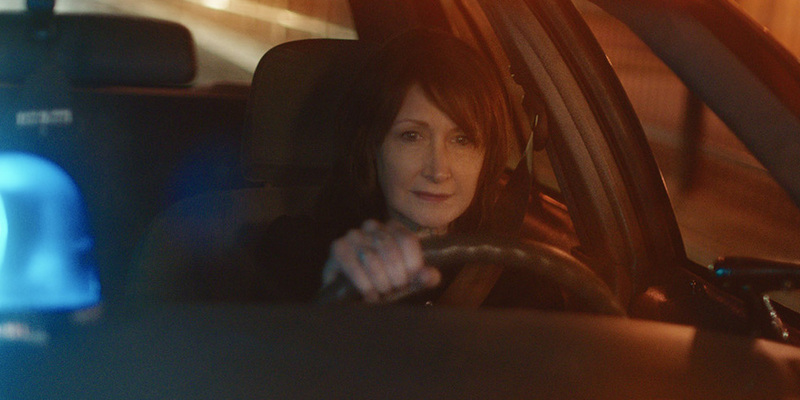 AS MIKE HOOLIHAN, a New Orleans detective and the gloomy protagonist of Carol Morley’s Out of Blue, Patricia Clarkson sustains an air of sardonic melancholy that nearly rescues the movie. 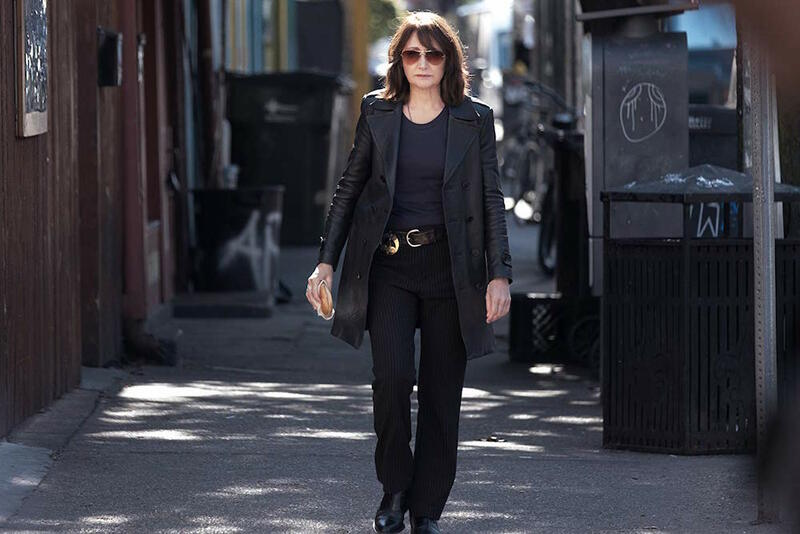 Introduced via the rearview mirror of her sedan, Mike sports sunglasses and dark colors as she navigates the Louisiana daylight toward a crime scene: the shot-dead body of Jennifer Rockwell (Mamie Gummer), a well-known astrophysicist. A short while later, in an interrogation room with Duncan Reynolds (Jonathan Majors), a colleague (and lover) of Jennifer’s, Mike asks, “You sure you don’t want a lawyer?” As he fumbles through a response, Clarkson—with one hand in her pocket and her head slightly cocked—just stands there, unmoving, for close to thirty seconds, studying the man’s body language with an arresting stillness. It’s a small coup of actorly patience that’s indicative of Clarkson’s overall performance: settled, determined, unrushed. Morley recognizes this, holding the shot as Mike sizes up her subject and internally formulates a strategy. This interaction encapsulates the comic dissonance—the jaded, seen-it-all cop butting heads with a long-winded professor harboring romantic notions about time dilation and the like—that was central to the appeal of Morley’s source material, the British author Martin Amis’s Night Train (1997). A simultaneous send-up and evocation of the hard-boiled American detective story, Amis’s book unsurprisingly proves a challenging basis for a feature. (Morley’s choice to set the movie in New Orleans—Clarkson’s city of birth—concretizes the ambiguous geography of Night Train.) Amis’s willing refusal of traditional motivation precludes the possibility of a roundly satisfying, twists-aplenty whodunit. Night Train also achieves much of its power through Mike’s first-person narration, which travels dazzlingly among distant registers, from the forceful smack of the opening sentence (“I am a police”) to the winking weariness of some of Mike’s self-lacerating reflections (“Spend ten years fucked up . . . and you’re going to have a ten-year hangover”). Although the downbeat-noir idiom of Night Train is clearly movie-friendly, the book’s most gripping qualities—the exuberant literary panache, the intentional narrative frustration, Mike’s interior flights of cop jargon—are not easy ones to translate to the screen. Morley’s loose adaptation dodges the obvious route of simply having Clarkson narrate chunks of Amis’s prose. But in the difficult balance between the ironic and the serious, Morley leans in the latter direction, to the film’s detriment. With its flashbacks and visions and recurring symbols (moisturizing cream, snow globe, brooch), its naggingly foreboding Clint Mansell score, and its overreaching thematic interest in the workings of the universe (the line “We are all stardust” is solemnly muttered a half-dozen times), Out of Blue begins to seem like a humorless mood piece in desperate search of an actual mood. Morley seeks out brooding tangents at the expense of the lighter characteristics that are working in her favor—principally, Clarkson’s beleaguered unflappability and almost invisible touches of dry humor. Part of the problem is that Clarkson so adequately conveys Mike’s recovering-alcoholic fatigue that it’s hard to buy the character’s increasing obsession with the metaphysical context of the Jennifer Rockwell case. The weightless dialogues Mike maintains with Duncan and with Ian Strammi (Toby Jones), another coworker of Jennifer’s, do not foster any kind of investigative tension or even basic mystery; one of them opens with Duncan declaring, “The only way we can enter into a black hole is . . . is with our minds”—an uphill battle for any scene to come back from. (Nor is it particularly enjoyable to have multiple discussions in which people explain to Mike the meaning of Schrödinger’s cat.) Compare this to a later conversation that begins with Jennifer’s bereaved mother, Miriam (Jacki Weaver), barging into Mike’s car and breathlessly asking, “You’re not naturally a brunette, are you? You a blonde?” Unlike the Duncan question, Miriam’s line instantly establishes a dash of humor—how will the systematically stoic Mike respond to this unprompted inquiry?—and the prospect of actual human behavior. In her prior work, Morley has established herself as a distinctive voice in nonfiction. Her best-known piece, Dreams of a Life (2011), chronicles the story of Joyce Carol Vincent, a Londoner who died sometime in December 2003, at the age of thirty-eight, but whose body remained undiscovered in her apartment for nearly three years. Morley placed an ad in a newspaper and on the side of a roving cab, requesting the insight of people who knew Joyce; she then stitched together the talking-head recollections with imaginative original footage in which Zawe Ashton (lately of Greta and Velvet Buzzsaw) performs the role of Joyce. (One sequence sees Ashton lip-syncing at length “My Smile Is Just a Frown (Turned Upside Down),” by Carolyn Crawford.) The resulting movie offers a vivid psychological profile while resisting pat explanations—a feat that links Dreams of a Life with Morley’s The Alcohol Years (2000), a fifty-minute recollection of the director’s own adolescence and early adulthood in Manchester, during which she often drank to excess and pursued random hookups. Morley does not attempt to explain or solve her past behavior in any way, but simply listens to the mosaic of voices and offers sensory scraps of bleary nightlife memories. Like Out of Blue, Morley’s previous forays into fiction—Edge (2010), an ensemble number about a revolving door of lost souls who wind up at a seaside motel, and The Falling (2014), a thriller about a mysterious affliction that breaks out among the student population at a strict-protocol girls’ school—contain intermittently stirring atmospheres but a confused narrative sense. Jennifer Rockwell, glimpsed throughout Out of Blue in recordings of lectures and interviews, was a beloved person and the daughter of a locally important man, Tom Rockwell (James Caan), a decorated Vietnam veteran and the owner of an electronics company. Jennifer was not thought to have enemies, nor was she believed to have reason to take her own life. The people who were in her orbit do not have many answers for Mike. In the movie’s sharpest moments, Morley suggests the sheer loneliness this investigation creates for her heroine. In an early scene, Mike uses a magnifying glass to key in on a background detail from one of Jennifer’s speeches. She then moves to share the discovery with her superior (Yolonda Ross). As she carries her viewing device across the floor, the terrific image by Morley and director of photography Conrad W. Hall captures nothing so much as the dour emptiness of the NOPD offices at night—the utter quiet, the slung-aside chairs, the low lighting. Most of Out of Blue shoots for an existential heft of a much grander variety, but it’s in these minor touches of workaday solitude that Morley comes closest to approximating the buried emotional mysteries of Mike Hoolihan. Out of Blue is currently playing in US theaters.